The life of a 17th century French Peasant was not easy. They owned few possessions and could barely provide food for their family. They worked the land for the French nobility, but they rarely reaped what they sowed. They lived a life of drudgery while famine and disease decimated their numbers in cyclical waves. Yet they struggled to survive, they worked, and they ate. Peasants were at the bottom of the social ladder. They were heavily taxed and frequently had to borrow money from a crude version of today's loan shark to pay the Crown, the nobles and their Seigneur. They worked in their homes as cooks and tilled their land. According to Vincentians.com, they did all the manual labor, and then trudged home to a single room dwelling, where they sometimes put together a meager meal of soup with lard or offal. There was common land in the center of towns where peasants could forage for firewood and fruits and nuts, but rarely was there enough to provide for a family. When the harvest was plenty, the peasants could count on grains for their bread, but in times of famine, they would resort to foraging in the woods and eating moss and dirt. In times of dire circumstances, according to Ordinary Times, peasants were rumored to have resorted to cannibalism. Modern peasant bread is a heady mix of grains such as rye and wheat, the crust hard and crunchy, the aroma reminiscent of a hot summer day. Unfortunately, the bread of 17th century French peasants consisted of inferior grains to that of their noble neighbors, such as rye and barely. These grains were coarsely ground on a millstone, often cut with stalks, chaff (the scaly casings of the seeds of cereal grain), grass, tree bark, and even sawdust, according to Ordinary Times. Not only was the bread barely edible, the cost ate up a large percentage of the peasant's meager budget. It was one of their greatest expenses. In addition to peasant bread, black bread was also a dietary regular for French peasants during the 17th century. 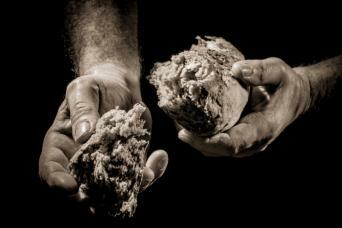 Consisting largely of rye grain, black bread is coarser than finer milled wheat bread. Some peasants were able to keep a small plot of land and raise a few animals which made life just bearable. It is reported that although they might eat chicken on special occasions, and other preserved and heavily salted meats, their diets lacked essential minerals and vitamins, such as vitamin C and D, and they suffered from scurvy and other diseases. Today, cheese is an art form in France. In the 17th century, farmers would do their milking in two rounds, the first, according to FrenchforFoodies.com, "le Bloche," the second the "re-Bloche." The second round was less rich with a lower cream content. It is likely that peasants might eat the "Reblochon" or something of further inferior quality. If by some chance the family kept a cow, they could use the milk for butter and cheese. The region where they lived dictated much of the peasant's diet. In southern climes, fruit might be added to a diet. Season also played a part in the foods available. Thus, both fruits and vegetables were often put in brine and preserved. In the area of Calais, Le Poulet Gauche indicates that "leeks, cauliflower, artichokes, chicory" were grown. Vegetables, such as onions, were added to soup to make a thick pottage which was eaten daily. Although the potato was introduced to France during the reign of Louis XVI, it was viewed with skepticism. As is so aptly stated in French for Foodies, "... in its raw green state the potato is somewhat poisonous and not even dogs would eat them, the potato was a hard sell." Potatoes did not become a regular feature to the French diet until the 18th century. The most popular drink in France was wine, followed by cider. The wine was watered down, and the poor often had to resort to water alone. Apples were grown along the western coast from the south of France to Normandy, and cider was sometimes favored over wine. According to Le Poulet Gauche, beer was made in Flanders and near Lorraine, in the northeast region of France. In times of poor harvest, the production of beer might be curtailed because the grains were needed for food. The Le Nain brothers depicted a warm and intimate portrayal of 17th century peasant life in the painting, Peasant Family in an Interior. Although these times have frequently been romanticised, this idolized version of French peasant life is more of a myth. In reality, conditions were far more harsh. According to an old story recounted in Ordinary Times, a peasant was asked what he would do if he were king. He did not request to marry the princess. He instead replied, "I would eat nothing but grease, until I could eat no more." That is a very revealing statement about the scarcity of food for French peasants.